Poker PROductions announced this week that its popular poker television program “Poker After Dark” has concluded the taping of its seventh season. Filmed at the Aria Resort and Casino at CityCenter in Las Vegas, the season premiere will air the week of January 3rd onNBC. Season 7 will tie for the second longest season in the show’s history, spanning 13 weeks. The fifth season, filmed in 2009, was the longest at 16 weeks, or 96 episodes. The upcoming season will build on the popularity of cash games, all but phasing out the original six-handed sit and go competitions upon which “Poker After Dark” was built. CardRunners instructor Brian Hastings announced on his blog late last week that he will be making his first televised poker appearance on NBC’s “Poker After Dark.” Hastings said that he will join fellow Full Tilt Red Pros Phil Ivey and Tom Dwan as well as high-stakes regular Phil “OMGClayAiken” Galfond in a $300/$600 Pot Limit Omaha game with a minimum buy-in of $100,000. Hastings wrote the blog while en route to Las Vegas for the taping of the show. On Sunday flanking NFL coverage on FOX, a new episode of the PokerStars “Million Dollar Challenge” aired. The Chris Rose-hosted show has become one of the industry’s staple television series and last week, Johnny Whitt from Houston, Texas challenged a stable of PokerStars pros and celebrities. On the line was a $100,000 match against Daniel Negreanuand a shot at $1 million. Whitt faced off against a half-dressed Sara Underwood in the first round. Negreanu sat beside Whitt throughout the match, which saw Underwood take an early lead after Whitt’s open-ended straight draw failed to come through. Underwood opened up a 2:1 chip advantage as a result, but could not hold up. The Victory Poker pro moved all-in with 10-8 on a board reading Q-8-5-6 for a pair of eights. However, Whitt had her dominated with Q-8 for top two pair and Underwood was drawing dead to the river. Whitt received a $5,000 trip to the Bahamas for the 2011 PokerStars Caribbean Adventure. 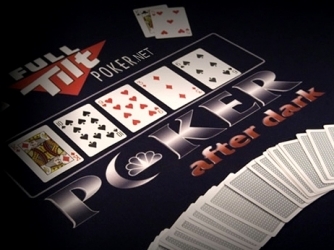 The finals of the Full Tilt Doubles Poker Championship began airing on Saturday night on GSN. The $50,000 buy-in tournament had worked its way down to four teams, each vying for a $1 million top prize. Every team left standing is guaranteed to take home at least $100,000 for making the final table. Allen Cunningham and Huck Seed began the Full Tilt Doubles Poker Championship finale with 600,000 in chips. Also holding 600,000 by virtue of winning a semifinal match werePartyPoker pro Tony G and David Benyamine. Coming armed to the action with 400,000 in chips were Phil Ivey and Chris Ferguson, along with Howard Lederer and Phil Gordon. Teammates alternate action by street and each pair was given three 60-second timeouts to talk strategy away from the table. In breaking news from Las Vegas, the seventh season of “High Stakes Poker” will tape from November 18th to 20th, as GSN has given the green light for the newest installment of the cash game poker franchise. 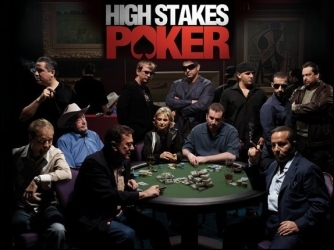 The location, time, air date on GSN, and players involved have not yet been announced, but poker fans can rest easy tonight knowing that “High Stakes Poker” has been renewed for another cycle. On the fleet of poker pros that could assemble for the show, a representative from GSN said on Friday that the network expects to have “another great cast of world-class players this year.” Five players have appeared on each season of “High Stakes Poker” to date: DoylesRoom front man Doyle Brunson, Eli Elezra, Victory Poker’s Antonio Esfandiari,PokerStars front man Barry Greenstein, and “Million Dollar Challenge” icon Daniel Negreanu.